2. Mix all ingredients for chocolate sauce(1tbsp cocoa powder, 4 tbsp almond milk, stevia, hazelnut butter & xanthan gum)and let it stand for about half an hour so that it thickens. 3. Blend all ingredients for the banana roll(2 bananas, egg white, whey, psyllium husk powder, baking powder & 1tsp cocoa) with a hand blender. 4. On a baking tray covered with baking paper, pour and distribute the banana mixture. 5. Bake in oven for 10 minutes. 6. Place baking sheet on a rack, turn the banana roll on it, remove the paper that it was baked on and let cool. 7. Mash a banana with a fork and mix it with half the chocolate sauce. 8. Spread it on the banana roll(that is not a roll yet ;)) and roll it up. 9. 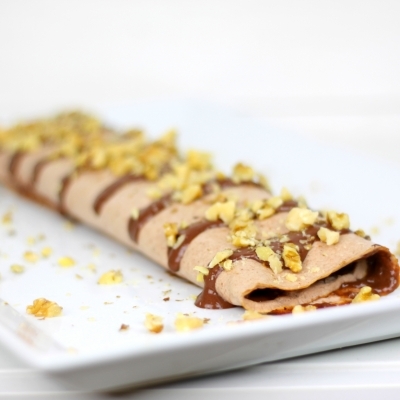 Serve with chocolate sauce and chopped walnuts.